We would be very grateful for your thoughts about the book. Please leave feedback below. Thankyou for my gift of a very interesting book,well researched. It gave me a bigger insight about things I hadn’t realised had happened during that war. Really pleased you enjoyed it so much. Rather different from your RM experiences of WW2. it is a very interesting thought that the Maharjah had employed a German Officer. I can make touch with the JAK Rifles Regimental historian and check. My own knowledge of WW1 sugests this is unlikely. Do you have any more details? A fascinating read, well researched and presented. The book gives a great insight into the early years which lead to the creation of the independent countries of Kenya and Tanzania, from the view point of those who experienced first hand the challanges encountered in the field. Highly recommeded as background reading to any visitor or traveler to those two countries. Very glad you enjoyed it. There are some intersting battlefieds to visit, notably the port of Tanga and the Taveta Gap in the foothills of the Kilimanjaro. The Tanga Railway line is hardly functioning where as the central line from Dar es salaam is vibrant. Have a good trip. After spending several months in Tanga in 2012, snooping around war cemeteries it was interesting to discover this book. From my photographs I was transcribing the names of fallen soldiers named on the stone screen at one of the Commonwealth Cemeteries (next to Usagara School where we worked) and I saw the tenth panel listed troops who died in 1915, later than the Battle of Tanga. So I started digging further about these soldiers from the 2nd Kashmir Rifles (Body Guard Regiment) and discovered this book. I notice there are two officers and 23 other soldiers buried there from the 2nd Kashmir Rifles stemming from events in 1915. 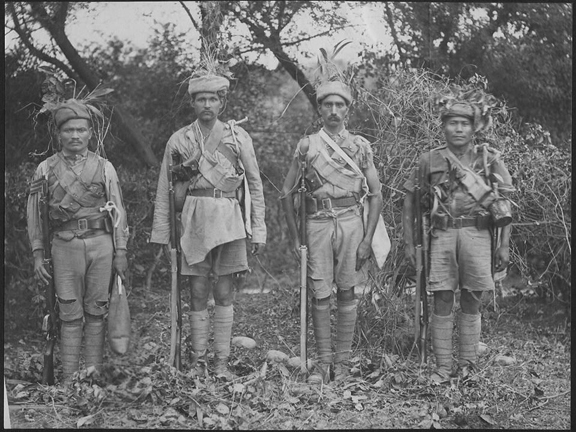 There are also a number from the Jind Infantry. The screen refers to them with the words “All of whom fell in this neighbourhood.” And I see from my pictures that some other of the fallen who are buried in that cemetery are from the Kashmir Rifles (2nd, 3rd Regiments) from the Battle of Tanga in 1914.